. : Optics & Photonics Focus :: A Brighter Summer under the Ice :. While Venice and other coastal cities around the world are slowly sinking, during the Arctic summer the waters underneath the ice become brighter and brighter. 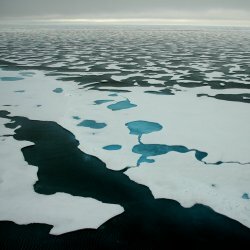 Are these two scenarios connected to the continuous thinning of Arctic ice? A patchy summer landscape. In summer, off the north coast of Alaska, the Chukchi and Beaufort Seas are a mosaic of open water, bare ice and melt ponds. Courtesy of Bonnie Light. Alaska, Summer 2010. It is a cold, yet sunny day over the ice, with mild temperatures around zero degrees Celsius. Quite normal for Arctic summers! But there is something strange below the ice: a diffuse light, brighter than expected. 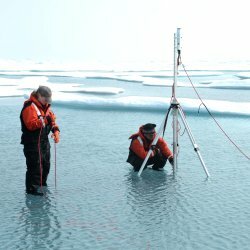 The three North American researchers who performed the field measurements – Karen E. Frey at Clark University (Worcester, Massachusetts), Donald K. Perovich at Dartmouth College (Hanover, New Hampshire), and Bonnie Light at the University of Washington (Seattle, Washington) – are very careful not to jump to conclusions, but these findings are quite puzzling. Is this increased brightness a consequence of global warming? And what impact could it have on the Arctic ecosystem? According to Perovich, the main reason for this unexpected brightness is "the shift from sea ice that is several years old and thicker, to sea ice that is only one year old and thinner." In water lying under thick bare ice, sunlight becomes fainter and fainter as we submerge deeper and deeper. However, and whether due to global warming or other local factors, ice in the Arctic has been increasingly melting over the past years, slowly thinning from perennial ice to first-year ice. Should we happen to visit the Chukchi and Beaufort Seas off the north coast of Alaska in the summer, for example, we will be presented with a mosaic of open water, bare ice and melt ponds, a patched composition of shades of blues and whites. Little data exists about the light distribution beneath this patched landscape; "we have precious few measurements of light transmittance," Light explains. The observations by the three North American scientists show some unexpected results. Moving along the water column beneath the bare ice, the brightest areas are not immediately below the surface, but about five to ten meters deeper; only after this peak does the sea become, as expected, darker and darker the deeper we go. As Light confirms, "what was unexpected was the amount of light observed at depth in the water column beneath the bare ice." What could be the reason for such behavior? The first thing to take into account is that, in the patched landscape of the Chukchi and Beaufort Seas, melt ponds transmit ten times more light than bare ice. This allows sunlight to penetrate deeper into the water below the ponds. Yet, this alone cannot explain why the distribution of light below the ice is so unexpected. The second factor, in fact, is that the ice scatters this light in such a way that some of it can be observed at depth, exactly five to ten meters below the bare ice. At work under the ice. The team of researchers is measuring the light transmittance below the ice in the Arctic. Courtesy of Donald K. Perovich. Brighter also implies warmer. The fact that "the amount of sunlight transmitted through the ice into the upper ocean is increasing," Perovich explains, "means that more light is available for biological activity and warming of the ocean." Nonetheless, the implications of this increased brightness on the Arctic ecosystem are "a topic for ongoing research," Light admits. "This work is a piece of the puzzle for understanding how sunlight interacts with sea ice. During the summer melt season, an ice cover can have strong horizontal inhomogeneity in its optical characteristics, and this study has allowed us to look at how the effects of this inhomogeneity are spatially distributed." And she adds: "Clearly the vertical and horizontal distribution of shortwave radiation beneath an ice cover will affect the spatial distribution of water column heating and the availability of light for primary production." The precise long-term implications of these findings remain to be seen. However, as concepts such as global warming and ice-caps melting become more and more common in our everyday vocabulary, these new findings provide us with new experimental evidence as to how events are tightly interconnected, and as to how small changes may alter apparently solid equilibria on our planet. Karen E. Frey, Donald K. Perovich & Bonnie Light, The spatial distribution of solar radiation under a melting Arctic sea ice cover, Geophysical Research Letters (2011) 38, L22501 (link).